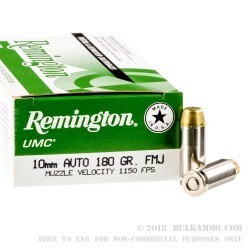 10mm ammo at a bargain price, with reduced recoil and a record for incredible reliability. 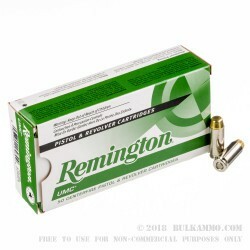 This Remington round is a 180 grain full metal jacket load with a good velocity that helps cycle the heavy sprung actions of modern 10mm firearms, but doesn’t’ have the same punishing power of most 10mm loads. 1150 fps out of the bore means this is still a stiff load, but the recoil is slightly more realistic for those who sometimes don’t prefer the hefty pounding a day at the range with a 10mm can present. Nickel plated brass and the low fouling metal cased projectile with a boxer primer means you won’t wear out your barrel, it is easier to clean than most range rounds, and at the end of the day, you get a reloadable case. 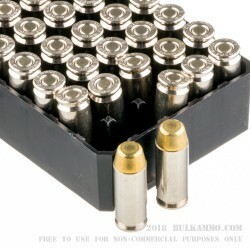 Most shooters of 10mm keep their cases, it just makes sense when the cost of 10mm is so steep. So this excellent range round serves a few purposes: clean burning, low recoiling and easy to shoot; reloadable; and cheap – it’s a 10mm shooter’s dream for practice ammunition. 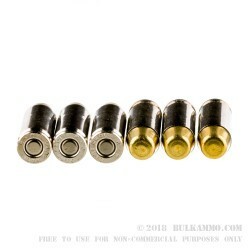 Suitable for use in any 10mm firearm. This round offers a significant savings over typical 10mm offerings and has all the legendary reliability of the Remington brand name.